Students begin with a brief review of what they know about major geographical features of Europe. Then, they work in small groups to research specific types of European geographical features, such as mountains, waterways, and climate. Next, they read about the Medieval Warm Period and the Little Ice Age, two marked climatic changes that had major effects on European history. Finally, they learn about medieval European life and its connection to geography. In this experience, students begin with a brief review of what they know about major geographical features of Europe. Then, they work in small groups to research specific types of European geographical features, such as mountains, waterways, and climate. Next, they read about the Medieval Warm Period and the Little Ice Age, two marked climatic changes that had major effects on European history. Finally, they learn about medieval European life and its connection to geography. 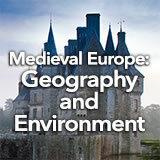 Locate and describe the physical geography of medieval Europe. Identify the ways that geography influenced medieval European civilization. Europe is one of the smallest continents, but it has a rich history. 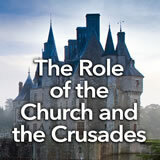 In this experience, you’ll learn how its geography and history are connected. See how much you know about Europe. (Don’t worry, this isn’t a quiz!) Look at the physical map of contemporary Europe below. Do you know more about European geography now than when you started this experience? You’ll learn more during the scenes that follow. Write one or more things that you knew about European geography and one or more things that you just learned. Briefly discuss the results of students’ table as a prelude to learning more about Europe’s geography in this experience. Divide students into their small groups for the next scene. Assign each group one of the following geographical traits of Europe: waterways, mountains and lowlands, and climate. When everyone is ready to continue, unlock the next scene.